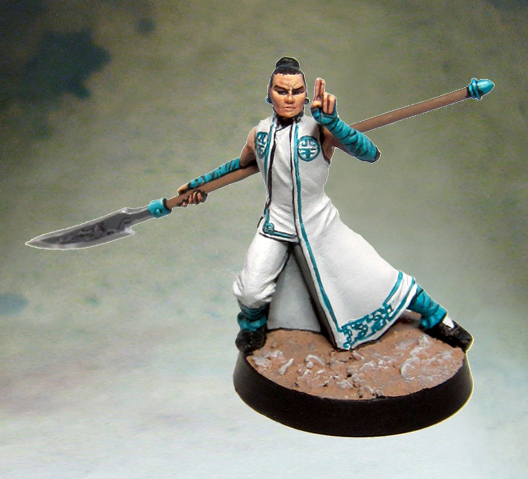 The Empire of the Jade Triad is the main human nation of the game. As in the Aurloks, it is possible to build very versatile bands but without necessarily having the disadvantage of the sub number. The construction of a Jade list must be balanced. Indeed, basic miniatures and elite troops are fairly average and are not very synergistic between them (except alchemists of course), but complement each other well within a single list. Well maneuvered, a band of the Jade Triad can use any strategy and adapt to his opponent, even in the game. Contrary to what one may think at first sight, the Jade Triad plays on both attack and defense. A troop is often articulated on a defensive core and some very offensive troops, all supported by one or more alchemists or some shooters. In fact, it plays a lot more on the counterattack than on the direct brutal assault, as does the Kingdom of Avalon. His versatility allows him to play the scenario while waiting for the enemy attacks, themselves under the threat of brutal attacks and fast Jade elites. A band of the Jade Triad can strike fast and strong but will hardly hold the shock in a long fight, unless it is very populous. It must act quickly on the scenario and the attack to win a quick decision. Playing a faction composed almost exclusively of base troops or elite troops is possible but requires finesse in use, both types having major defect (lack of strike force in the first case and sub-number and fragility in the second). Advantages: The Jade Triad has several major advantages, and first, alchemy. The Triad is the faction with the largest number of alchemists: five profiles for seven recruitable alchemists. Alchemists are generally cheap and have powerful formulas and abilities that can help their survival or help their alchemical skills. This is clearly their biggest strength. Second advantage: the omnipresence of the skill elongation among the base troops. This skill makes any troop, even the weakest, very threatening. 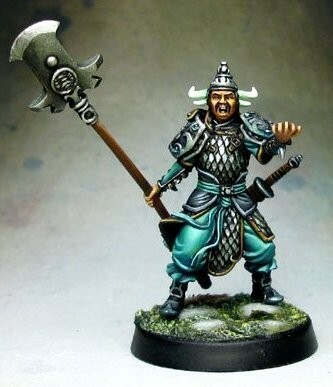 Finally, the Jade Triad is a relatively large faction that can combine popularity and quality. Weaknesses: It must be recognized that the Jade Triad does not have much defect, as it is possible to fill the defects of a miniature with another in the same band. The main pitfall is the fragility of the troops. With the exception of two heroes and Size 3, no miniature is greater than nine life points and the faction’s average Defense Rating is quite low. Facing a strong opponent and striking hard, the Triad can be put in difficulty. 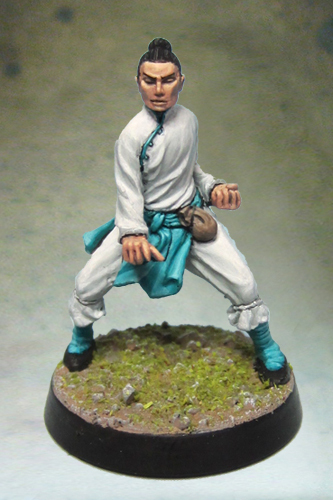 A fighting hero of the Jade Triad, Lee Ping is a leader capable of attacking any type of opponent and killing him in a single activation. His high Combat and Reflex characteristics often allow him to hit first and hit any opponent. His damage table is very modest for a hero but his sequential attack skill can wreak havoc! It is particularly effective against base troops that it can hurt very easily. 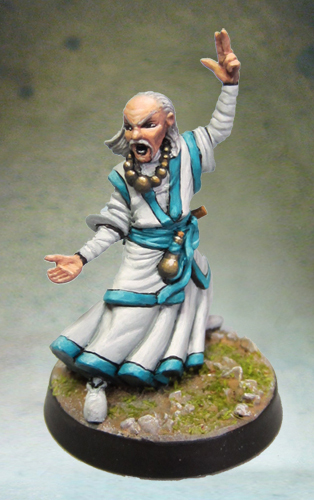 Fu Nihao is a tactical leader of the Jade Triad. 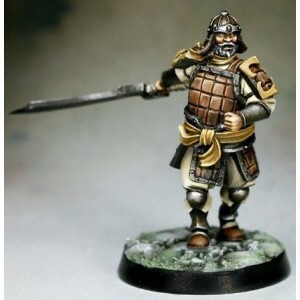 His two tactician skills give him significant bonuses during deployment and initiative rolls. But it is not left at the level of the fight. He is indeed an excellent fighter, his long reach giving him a very important ray of threat. Its excellent damage table, high characteristics and four Action Points make it a threat to be taken into account by all opponents in the field. 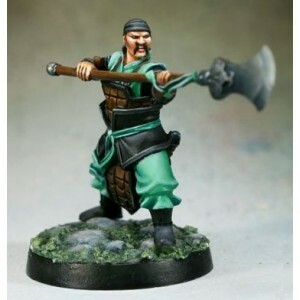 With only one but very powerful formula, Feng Sao is there to scatter the opponent to the four corners of the battlefield. Its formula physically repels opponents while inflicting damage. With his very high defense, Feng Sao will be very hard to hit once he has launched his formula. Only the elite can attack him. It must, however, be played in a rather isolated manner, on pain of including its allies in the devastating field of action of its formula. 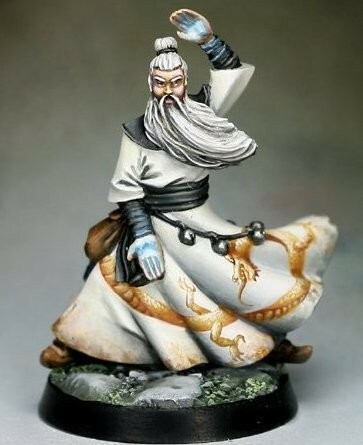 Xian Ling is a particular alchemist, playing a lot on dodge. Its first formula allows to swap the place of two friendly miniatures. This allows an ally to come out of a bad situation or to advance quickly on the scenario. His ability Acrobat can save him from many attacks, including those carried out by the base troops. His second formula allows him to transmit this ability to the allies. It has an excellent quality / price / chance of survival. 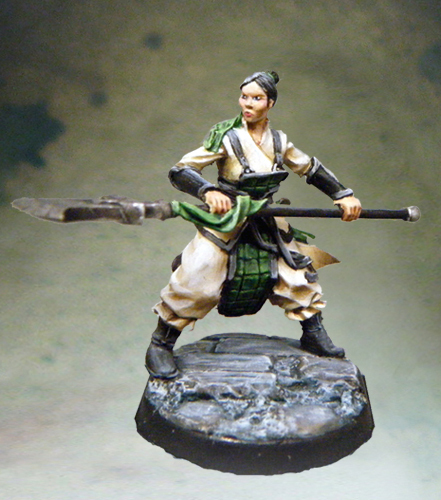 Chen Sze is the murderous heroine of the Jade Triad and Cobra Guard. It’s an excellent fighter and aligns with the game’s best Reflex and Fight abilities. Its ability to activate just after a Shadow or Whisper is strategically very powerful, allowing it to complete an opponent or break through the storyline. Its three Action Points and its small number of Life Points make it fragile however and requires to play it carefully. 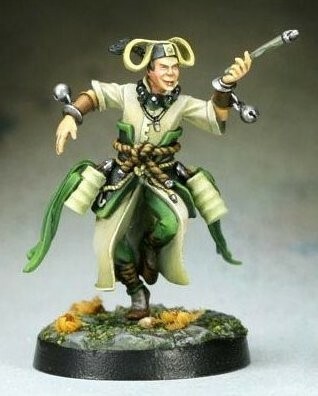 This alchemist is best known for his famous Blast of Wind. This formula makes it possible to put the opponents on the ground, it is extremely powerful and must be launched as often as possible, either to make lose action points to the adversary, or to allow the allies to attack these defenseless targets. Its formula is so powerful that it makes the first anecdotal that reduces the damage inflicted by the opponent. New cheap alchemist for the Triad, the Alchemist of Crystal Sun is able to boost his allies in a surprising way. His formulas allow Stealth to be given to allied miniatures in his aura, as well as to maximize the damage inflicted by these if they are in range. If the concentration is sufficient (which is easy via one of his special abilities), this alchemist can turn any ally into a real monster. 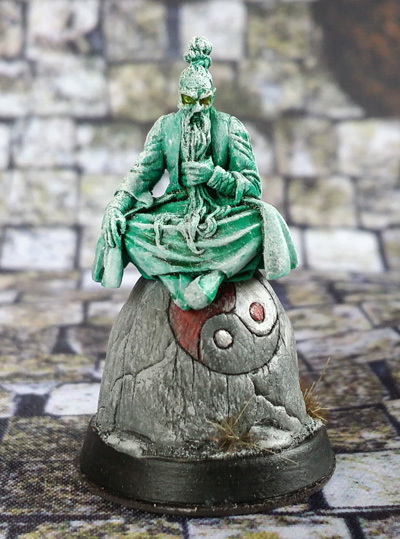 A low-profile minor alchemist with only one formula, the Disciple is a great addition to a band of the Jade Triad. Its formula indeed provides the Tracker ability to the allies. Strategically very strong, it allows to give a great mobility to the troop. In addition to his formula, his own skill Ranger, gives him a welcome mobility to play scenarios on which alchemists have an advantage. 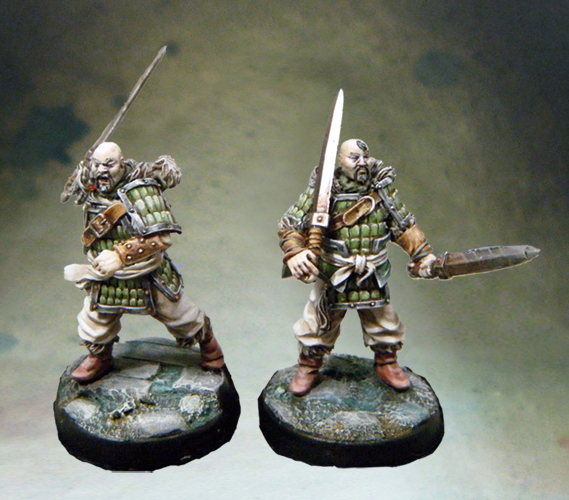 Militia-Lancers are the basic troops of the Jade Triad. In spite of their rather weak characteristics, their competence Long Reach as well as the possibility to align up to four militia-lancers, at the rate of two per card and for a low cost, make rather dreaded troops. Long Reach makes it possible to attack the opponent without fearing a riposte, and forcing him to use his Action Points by drowning him under the number. 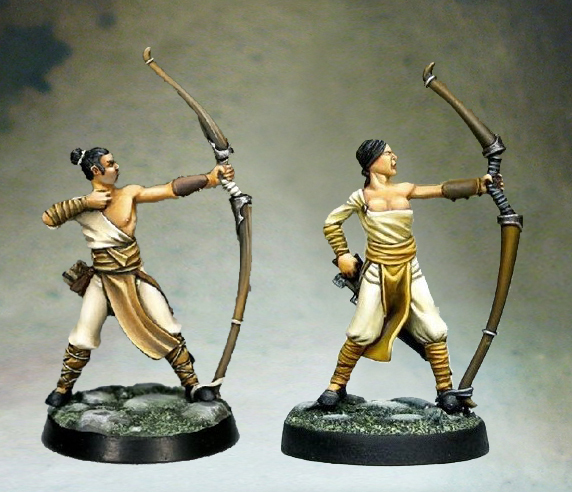 The Militia-Archers make up for their small damage with a monstrous range of fire. If the player optimally manages the placement of scenery sets and archers, the Militia-archers will be able to shoot the whole game without ever having to move. Available in pairs on the same profile card, it is possible to align up to four in the same troop. The Chonkey, despite its extremely low profile, has two uses. The first is to pick up components for the alchemists and the second to take attacks and arrows instead of his allies through his Guard skill. It is therefore perfect to accompany and protect one or more alchemists. Its small size makes it easy to hide behind a scenery set. The Triadic Guards are a basic troop of better quality than the Militia. Their characteristics and Untouchable skill make them very good defensive troops, also effective in attack thanks to the skill Long Reach. They are therefore very versatile basic troops. The presence of a Triadic Sergeant further increases their defensive abilities. 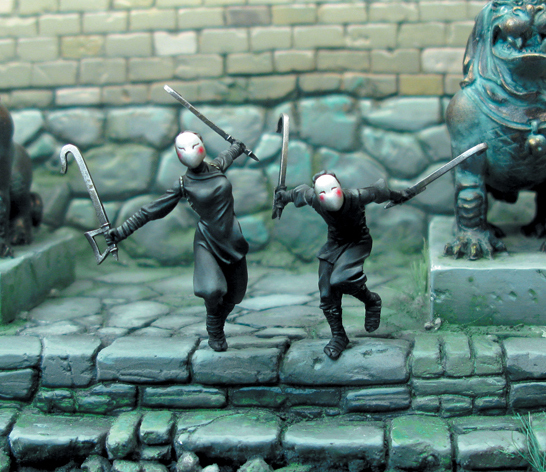 Assassins of the Jade Triad and the Cobra Guard, the Shadows are formidable fighters, furtive and deadly. With excellent reflex value and a reverse damage table, they are specialists in the Rapid Attack Combat Card. So they attack very often first, inflicting heavy damage. However, be careful with their very small number of Life Points, which requires choosing the targets carefully. 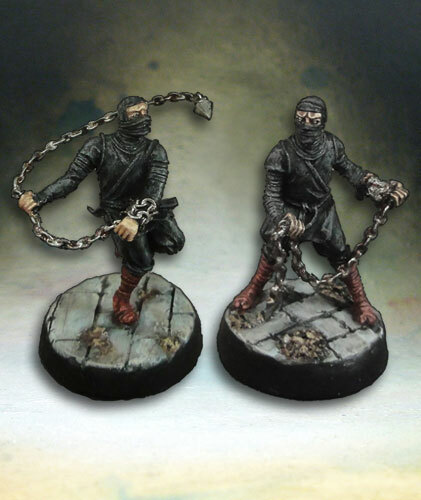 The whispers are the other assassins of the Triad and the Cobra Guard, specialized them in the attack at a distance. They are the best shooters in the game, combining great strength and high damage. Their Stealth offers protection that compensates for the short range of their weapon. Tailored to play first, they inflict wounds and penalties on injured opponents to allow the allies to come and finish them. The Triadic Sergeant can only be recruited if the three Triadic Guards are also present in the troop. He has the same cost and profile as the latter, except that he has three Action Points and the Expert Parry skill, which he also grants to other Guards while its is alive. The Triadic Sergeant thus offers a solid defensive base for any composition of the Triad. Troops of elite three Action Points, Sentinels shine by their versatility. With average characteristics and damage for an elite, their Perce-Armor and Normal Expert abilities nevertheless allow them to tackle any type of opponent, provided they are supported. Their only defect is their weak defense, making them vulnerable to enemy fire and base troops. With an excellent profile, he specializes in hunting alchemists, benefiting against them a second table of monstrous damage. The combination of Long Reach and Feint is very ugly, allowing you to exhaust the opponent’s stock of Action Points before attacking him safely. This combo offsets his very progressive damage table against non-alchemists. 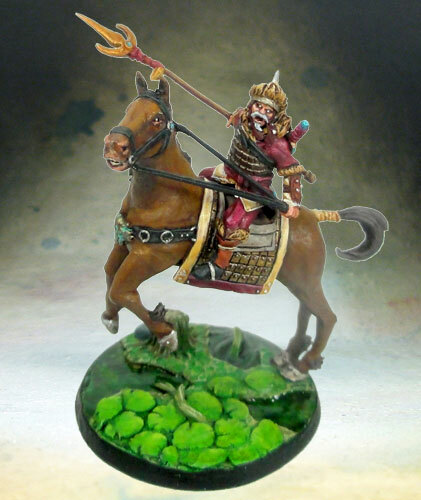 Size 3 of the faction, the rider of the Triad imposes its violence and mobility at the gaming table. It has all the characteristics of the great fighters and a comfortable pool of Life Points. Although boosted by the Sequential Attack, his damage table is pretty average for an elite of this price. 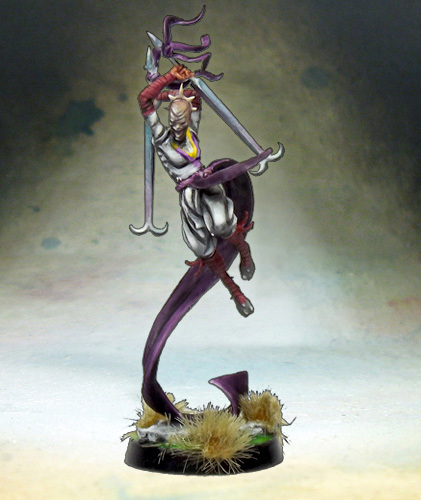 She must never get stuck in a fight and must move as soon as possible to maximize the advantage of her monstrous movement, the highest of the game, and the effects of her Cavalry skill.